CURIOUS LITTLE BIRD: Giveaway Results Take 2! Hurrah for me!! 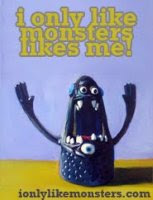 and for monsters!! !